Greetings from the Chamber Board Chair and Chamber president! We publish an Annual Report for our membership each July which covers the scope of our work and our priorities over the past twelve months, and allows you to assess how we have done. We recognize that times are changing and the Chamber Board has devoted time and resources over the past year to perform a “deep-dive exploration” of what we do, how we do it and what our community and membership truly needs from us. The process is called Blue Ocean Strategy (see www.blueoceanstrategy.com to better understand the concept). This examination has been a fascinating look into an evolving market of networking groups, online business support services and Young Professionals groups - all of which are also offered by your Chamber. The Chamber has been well-recognized at the state and national levels for its excellence, and we are one of the few chambers in the region to earn accreditation by the U.S. Chamber of Commerce. Over the past year and a half our Grow Northwest initiative has been instrumental in establishing an Economic Development for our area, as well as an active Safety and Security Task Force that works hand-in-hand with both the Sheriff and Constable Offices. Hurricane Harvey shifted our 2017-2018 plans considerably as it did for many families and organizations. As indicated within this report, we worked hard to provide the leadership and resources needed by many of our members who were severely impacted by Harvey. The Chamber strongly supports passage of the flood control bond in the upcoming special election, and we will work to insure that flood risks in our community are sufficiently addressed with the funding the bond will provide. With another active legislative session in 2019, and all of the initiatives that the Chamber is involved in, we have a lot of work to do, and a lot to be proud of. However, we know that we must keep pace with an ever-changing community – so expect some exciting changes! You can be a part of this change by downloading the “Discover Northwest Houston” app, which will link all of us in a way that traditional communication methods are unable to do. Thank you for your ongoing support of the Chamber and the community it serves. 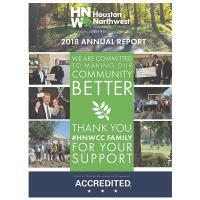 It’s a great time to be in Northwest Houston!